There’s a frisson of excitement when you stand on a packed platform at Clapham Junction railway station, at rush hour on a Tuesday whilst wearing your hiking boots. Pretty much everyone else is heading off to work, whilst you’re off for a day of leisure; to explore the countryside rather than sit in an office. Of course, the only reason I was actually able to be standing on the platform in my hiking boots, rather than be heading to an office, was related to the fact that I was between jobs. But that was an entirely different matter. After just over three years, I’d left my previous employment, with a plan to take a few months off before seeking new challenges. It would be a few months that would be mostly filled with childcare and a couple of personal projects, but there would be just enough time to squeeze in a few walks as well. Time which would give me a chance to do a few more sections of the Thames Path. It seemed like a plan. The train to Windsor pulled up on the platform and I leapt on board, fighting my way through the crowds of office workers. As it headed out of London the trains slowly emptied out, and by the time we arrived at the end of the line, it was pretty much deserted. Out on the streets of the town, it wasn’t much busier. Windsor at 9:30am was just a bit quieter than both Clapham Junction, and far quieter than it had been was I was last there back in the previous August. A handful of people were shuffling around the town’s streets, walking towards offices and shops, but otherwise the place was deserted. The general emptiness reminded me of my student days in Durham. During the summer the city would be packed; heaving with American tourists who would wander around gasping in awe at the city’s thousand year old cathedral and castle, exclaiming loudly that they were amazed by how “old” everything was. Sometimes the tourists could make living there a nightmare, especially when you were in a rush to get to some lecture (or the pub), and had to fight your way through the crowds in order to get to the right university building. But when the day trippers had all left, the place took on a magic of its own. Relatively peaceful, relaxed and almost tranquil. I felt sure the locals of Windsor felt the same way; like they’d hide when the visitors were around, and then pop out later to admire and be in awe of the place where they lived. I idly wondered about wandering around Windsor, but instead crossed the river and headed into Eton’s small but attractive main shopping street. The bridge means that the two effectively form a twin town; just one that’s split in two by the river. With its castle and royal connections, Windsor is inevitably the better known of the two. Indeed all I really knew about Eton is its educational establishment. Founded in 1440 by King Henry VI, the school was set up initially to take seventy boys from poor backgrounds, and give them an education that would allow them to proceed to Kings College, Cambridge, which was also founded by the King. Over the years it grew to become the favoured educational establishment for the aristocracy, or indeed anyone who could afford to pay its now substantial fees. Whilst some 20% of its pupils gain scholarships and financial assistance, the rest have parents or relatives prepared and happy to spend the required £35,000 a year in tuition fees and board. And at the end of it all, there’s no escaping the fact that its alumni seem to end up holding a huge amount of influence in the world. Whilst I’m sure a good proportion of the school’s pupils do turn out to be nice, well rounded people, there’s no escaping the fact that 19 of the UK’s prime ministers were educated there, and the school’s alumni have regularly filled the corridors of political power, from MPs to civil servants. And not just Eton either. The alumni of public schools seem to fill politics, despite the fact that only a relatively tiny proportion of children are educated in fee-paying schools. A few months earlier I’d watched a 1980s drama series which portrayed a fictional Labour prime minister, just after he’d won a general election. Said prime minister had grown up – and still lived – in a council flat, and had worked in the steel mills of Sheffield. Watching it, I couldn’t help be struck by the contrast with the governments of more recent years, full of people educated privately who were merely career politicians rather than people who had actually achieved anything in another walk of life. It was hard to wonder where it had all gone wrong. The “ordinary person” seems to be completely missing from modern politics; to that the extent that the leading political “anti-establishment” figure of the day, Nigel Farage, was himself educated in the public school system, and was a former stockbroker. My view on Eton College wasn’t helped by the fact that the riverside meadows I were now walking on, were owned by the college, and was littered with signs ensuring that all and sundry knew this fact; all worded in a tone that seemed to suggest us oiks were graciously being given access to it. 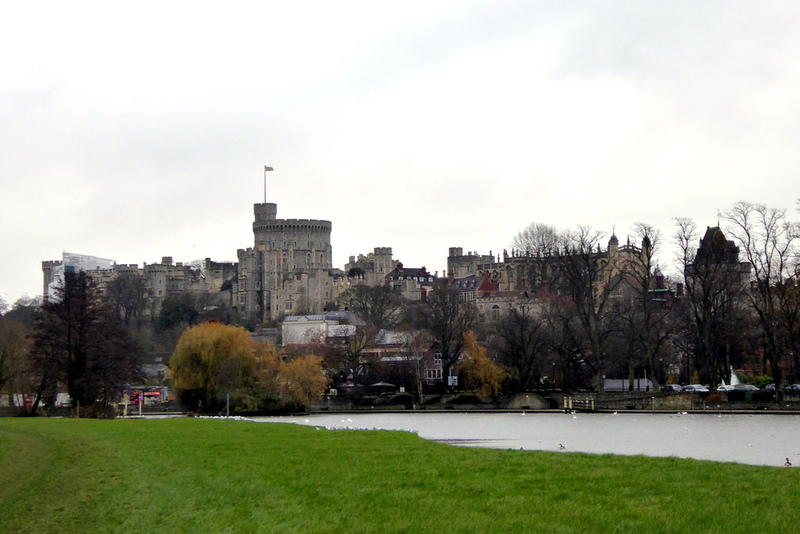 And then I looked back, and saw a mighty view of Windsor Castle; a beautiful sight, and a magnificent building. And one which I felt would look even better come the revolution, when fully opened up for the population of the United Republic of Great Britain and Northern Ireland to visit. It would be a while before I could escape the clutches of Eton College. A little way out of the town, a small plaque informed me that I was standing next to the “Atlas Bathing Place”. 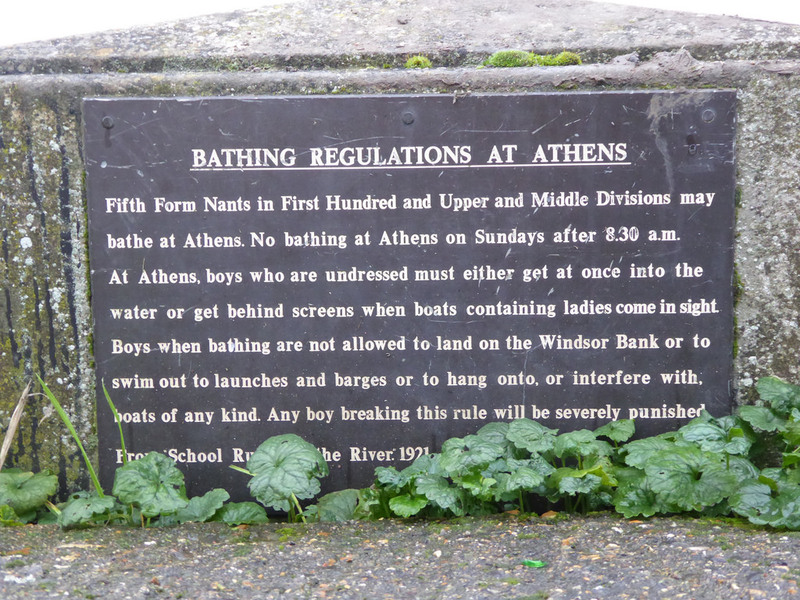 The bathing place was a spot gifted to the college, and where certain students (specifically “Fifth Form Nants in First Hundred and Upper and Middle Divisions” – nope, I’ve no idea what this means either) could bathe in the river. Although “boys who are undressed must either get at once into the water or get behind screens when boats containing ladies come into sight.” Quite how the students were supposed to know that a particular boat carried passengers of the female persuasion, didn’t appear to be specified. 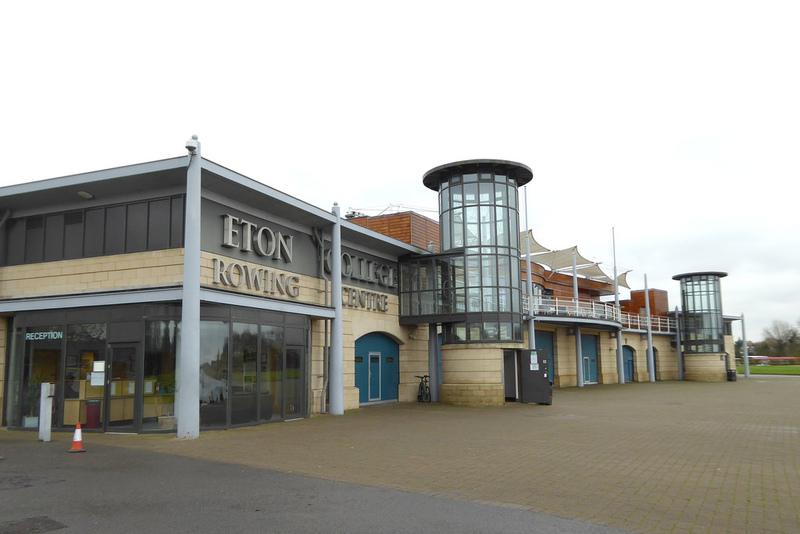 A mile on was another college outpost, this time the massive Dorney Rowing Lakes, which were used for the rowing events during the 2012 Olympics. Built over ten years, at a cost of £17 million (your school fees in action! ), the 2.2km artificial lake was used as a venue for the 2012 Olympics; a fact which was stated on several signs and plaques in the area. The rowing lake isn’t directly next to the river – it’s too winding for that – but it does run roughly parallel, and it took some time to finally get past it; the lake water regularly visible through the trees that lined the path. The trees would be a feature for most of the day, although any hope that the Thames would look glorious and autumnal were quickly dashed. Despite a mild autumn, it was too late in the year for such things, and the golds and reds of the leaves were long gone. Every now and then, I’d pass a solitary tree whose leaves were still putting on a display, but such occurrences were rare. The trees regularly had enough branches in order to prevent a good view – well, okay, a good photograph – of the other side of the river. One particular sight proved especially elusive. This was an island whose name will be familiar to all lovers of 1990s computer games: Monkey Island. Although the place got its name when one of its owners built a pavilion full of paintings of monkeys doing activities such as fishing and shooting, rather than having anything to do with the exploits of one Guybrush Ulysses Threepwood. The trees made the island impossible to photograph. Every snap I took was rudely interrupted by some hanging leaf or waving branch. My endeavours were not helped by the fact that the owners of several houses had erected large fences on each side of the path, turning the trail into an alleyway, and ensuing that the “lower orders” couldn’t possibly look at the owner’s property. Not everyone was so mean. One notable house had opted to forgo any kind of fencing and had simply marked out the boundary of their property with a row of well spaced out trees. Anyone from the path could see, and more interestingly walk, into the garden, should they desire. But such people were few and far between, with most people clearly wanted to be kept locked away behind giant metal gates and substantial fences; as if the owners feared the world and wished to be kept away from it. And to be fair, they probably did. Still, I took consolation in the fact that these people who had spent a substantial amount of money on their houses, and had pushed the Thames Path into walking down an alleyway, also had to suffer living in the shadow of the nearby M4, and all the noise that it produced. The motorway is carried over the Thames by a large bridge, and as I approached I noticed something rather unusual looking. I paused, and looked again. Yes, there it was. A staircase leading from the riverside, up to the road overhead. And one that was completely open. 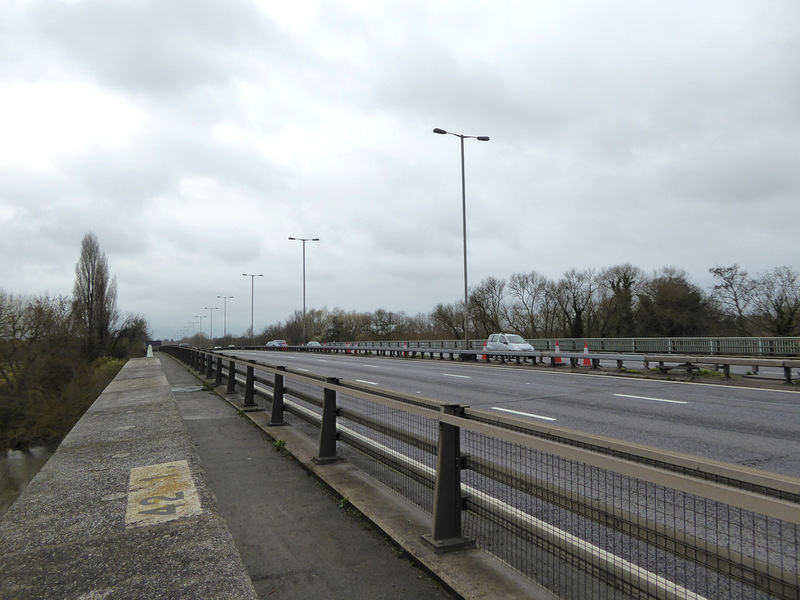 This seemed rather unusual – after all, pedestrians aren’t normally allowed to go up to motorways – so I wandered up to have a look. 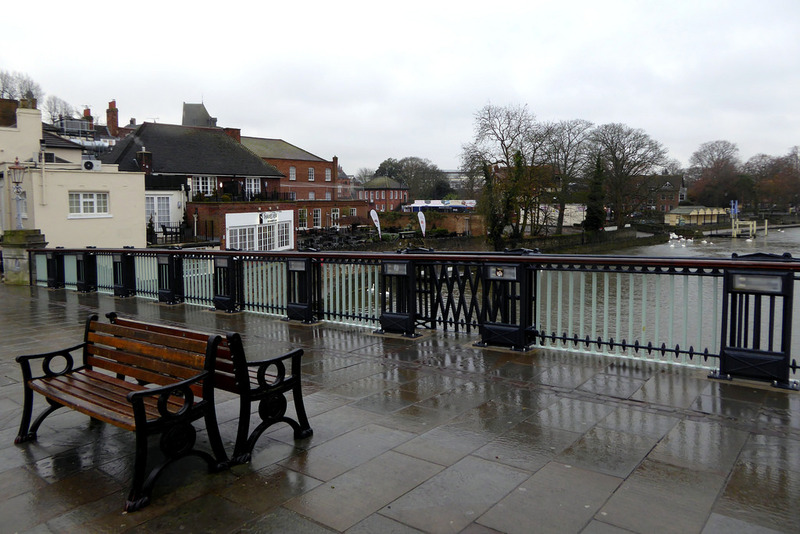 It turned out that as well as carrying six lanes of speeding traffic, there were also facilities for walkers, allowing people to access the village of Bray on the other side of the Thames. Besides being home to two of the four restaurants in the UK to hold three Michelin stars, including Heston Blumenthal’s The Fat Duck, I knew little about Bray. And as I was walking on the other side of the river to the village, my knowledge wasn’t about to be substantially improved. What I could tell was that the village had some substantial properties lining the river; mini-mansions which were no doubt the kind of places where the walk-in wardrobe is larger than the master bedroom of my house. Flying the Union Flag also seemed to be compulsory, with several properties having flagpoles in their gardens. Very patriotic. Yet there also seemed to be a sense of emptiness about some of them. Although it was hard to tell given I was on the other side of a wide river, some of the houses gave an impression of being deserted; used by their owners only rarely, and one of many similar places that they resided in. The morning’s display of opulence and wealth had begun to grate me a little; a situation not improved as the Thames Path was once again hemmed into an alleyway thanks to some home owner planting enormous hedges on either side of the path. But as I arrived at the outskirts of Maidenhead, the ridiculously oversized houses began to fade away, replaced by far more modest abodes. 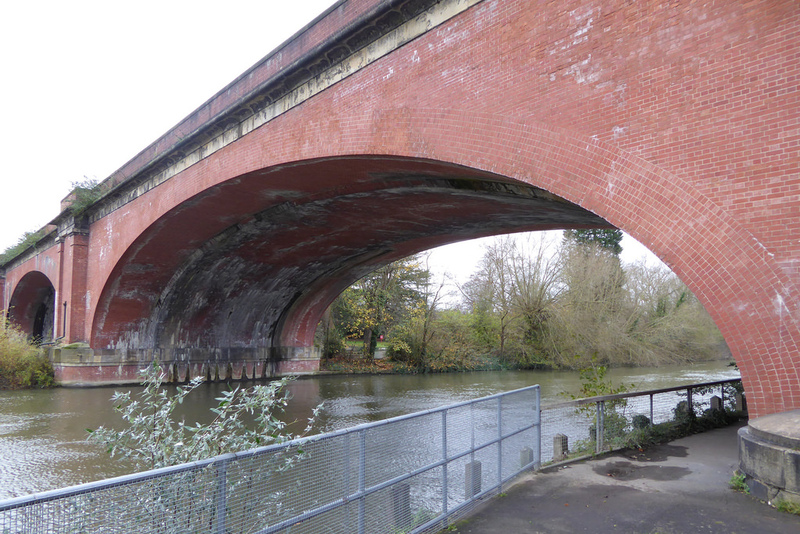 And then I passed under a different mighty structure: the Great Western railway line, carried over the river by the Maidenhead Railway Bridge. The two span brick-built bridge, designed by the Great Western Railway’s Chief Engineer, Isambard Kingdom Brunel, was completed in 1836, and had the widest, flattest arches of any bridge in the world at the time. Even in modern eyes, it’s an amazing structure and an amazing piece of engineering. A short distance on came the slightly older road bridge, and the Thames Path decided to head over it. 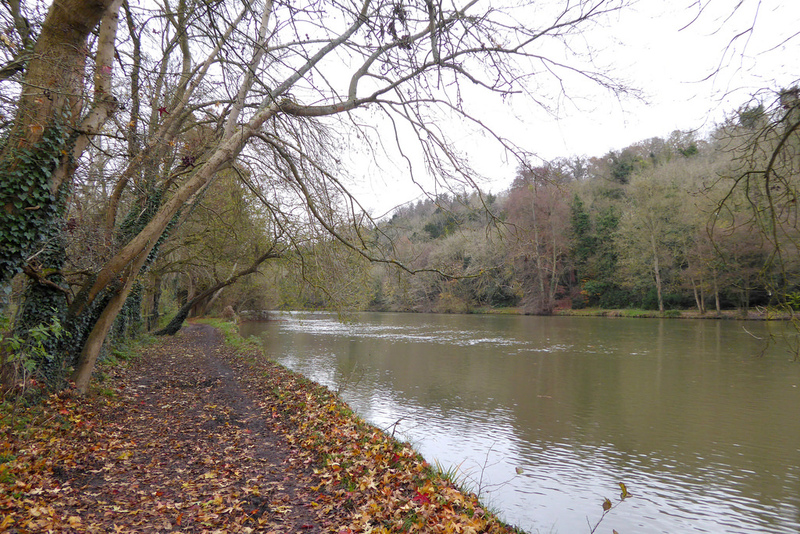 The river seemed to provide a natural boundary to the town, and whilst I was now walking on a paved path between a busy road and the river, the other bank soon emptied out, replaced by trees and greenery. It had been cold all day, and a bitter wind meant I was beginning to regret leaving the house without my gloves. So when a sign near a car park pointed out the availability of hot drinks, I was across the road and inside the café as quick as a flash; my hands soon cupped tightly around my cup of tea in an attempt to return some warmth to them. 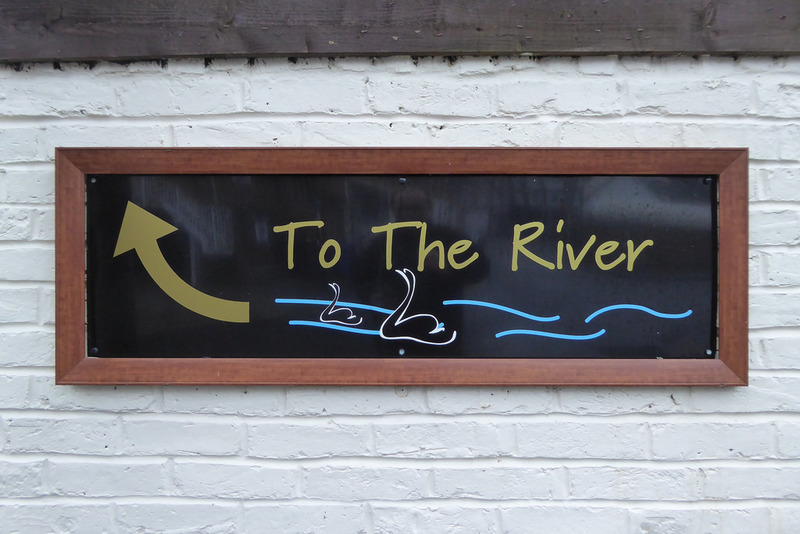 Back outside, the Thames passed Boulter Lock, with signs up informing potential users that the lock was closed for repair work. Not that there were any boats on the river, which was still and peaceful. Clearly a winter Tuesday was not prime boating time. Then the Thames Path did it had barely done before. It headed into the countryside. For all my Thames Path travels there’d been residential properties, parks or commercial development on at least one bank for pretty much all of the way; usually both. But now as I left Maidenhead, it all began to change. I was now walking alongside farms, whilst woods and forestry lined the other side of the river. It was a sign of what would be coming. The further the river would get from London, the fewer towns and villages it would pass through, and the more rural the Thames would become. 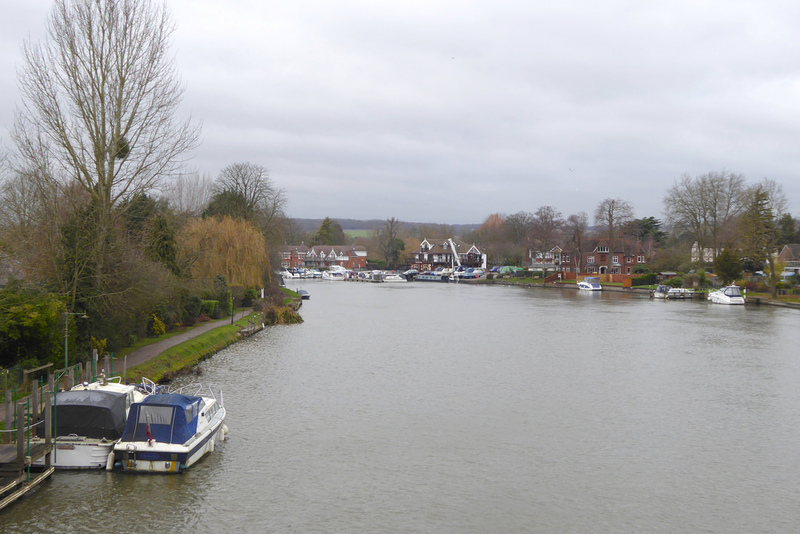 A few miles on, outside the village of Cookham, the trail headed away from the river; a move required by the fact that the Thames splits into four channels as it passes through the village. In years gone by, tow path users had been required to use three different ferries in order to follow the main channel. The ferries are long gone and these days it’s impossible to walk alongside the main channel of the river, and instead the Thames Path enters the village by a side road instead, towards the centre of the village. I strolled past a former Wesleyan Chapel that now houses a gallery dedicated to the local artist Stanley Spencer who was born in Cookham in 1891, and lived in the village much of his life. Spencer was not an artist I was particularly aware of, and as the gallery was closed, there wasn’t going to be much of an opportunity to rectify the situation. So instead I crossed the road opposite the gallery and headed on my way. As I did so, a car – almost inevitably, a flash sports car job – swerved round the corner at breakneck speed, slamming on the breaks as the driver finally decided that they probably should stop if someone was crossing the road. I paused for a moment, quietly calculating what would have happened if the driver’s reactions had been just a tad slower, and started walking across the road once again. It was an angry beep. Well it was inevitable. I mean, how dare I – a mere pedestrian – try to cross the road, how very dare I not anticipate that someone would try driving round a blind corner at 50 miles per hour, and absolutely how very dare I not start rush to get out of their most important way. It was very obvious that I was in the wrong, and I dutifully chastised myself as I reached safety on the other side, allowing the car to speed off down the road as fast as the driver possibly could. After that I inevitably didn’t feel particularly like hanging round Cookham, and I made my way quickly through the village streets and through a church yard, allowing me to get back to the sanctity and safety of the Thames; somewhere where no idiots in sports cars could do any harm. Bourne End was barely a mile down the river, and I was soon approaching the railway bridge, which also carries the Thames Path over the river at the same time. It was also time to make a decision. I could either leave the Thames Path at Bourne End and head off home on the train, or I could walk another four miles to the town of Marlow and catch the train from there instead. It was still early – barely half two – but if I was to head to Marlow I’d have to put my skates on and get there before the sun set around four. And then there was the fact that it was beginning to rain. I stood on the railway bridge, and looked down the river and made a decision. It may have been early, but it was time to call it a day. 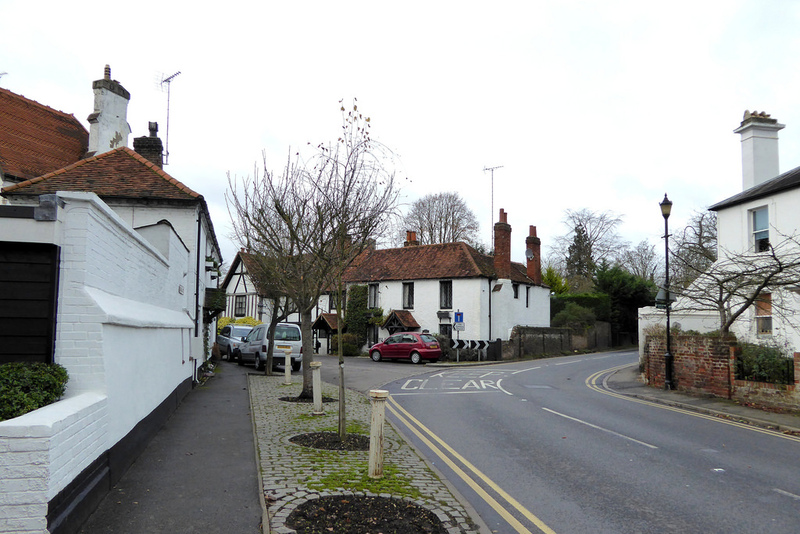 I crossed over, past a plaque informing anyone that cared that Callum Dunkin had won the Bourne End Bridge Rivet Challenge 2013 – whatever that was – and headed into the centre of the village. I idly looked around for a pleasant pub I could have a swift half in, but instead found two branches of the Co-op, an M&S and a Tesco all glaring at each other. Heading to the railway station it was then, and I prepared myself for a forty minute wait for the train to take me back to Maidenhead, from where I’d catch another back to London. The train would arrive and head up to Marlow first, and as it did so, I huddled in the tiny bus-shelter on the platform, trying to keep warm. “Cheers!” I replied, and rushed aboard to find he was certainly not lying. 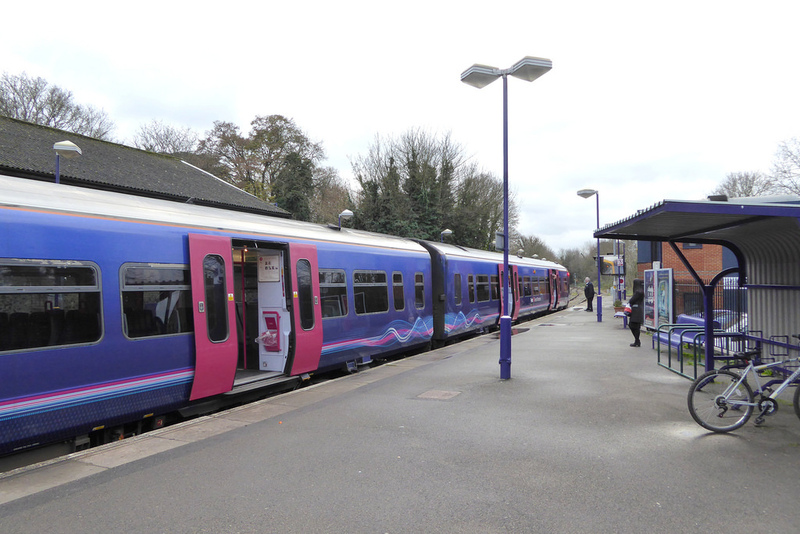 The train was warm and cosy, although painted in an alarming shade of lilac. And as it pulled out I mused on the fact that in the end, I was going to go all the way to Marlow after all. First Published: 7 January 2015. Last Updated: 11 July 2016.